Aresilient fibre material encased in a thin cover of PTFE. 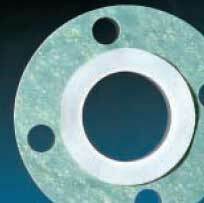 The resulting gasket combines the inertness of virgin PTFE with the mechanical properties of the compressed fibre sheet. James Walker supplies three envelope designs: Fin Type; Machined Square Type; Folded Tape Type. Flanged joints handling highly aggressive fluid media that would swiftly destroy the integrity of other materials. Often used with soft insert material on glass-lined pipework systems. Also used in food processing, where cleanliness and noncontamination are essential. • Standard design: most economical envelope gasket. • Suits majority of applications where highly abrasive media are NOT used, and turbulent flow will NOT create problems. • Needs clearance between insert and envelope inside diameter to enable insert to be fitted. • Provides continuity with pipeline bore for smooth flow. • Recommended where flange sealing width is restricted or thick inserts are used. • Supplied with serrated surface. • Has smooth surface finish – tape of PTFE is folded and joined by welding. • Used for diameters over 300mm. • Can be adapted to non-circular planforms. Cover: virgin Fluolion PTFE. Inserts: compressed non-asbestos fibre, synthetic rubber-proofed woven cloth, and laminated combinations of these. Custom made to suit all standard flanges and non-standard shapes.